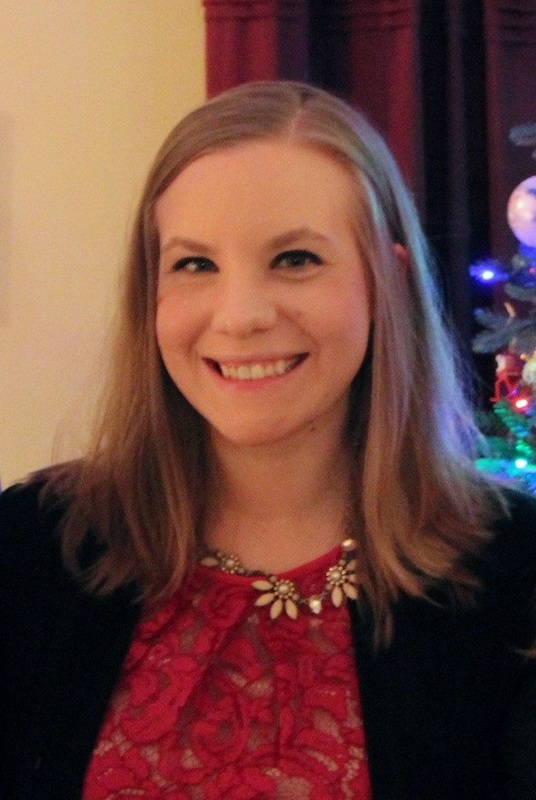 It's December and that means it's time to share my December Island Batik Ambassador project! This month our theme is table runners and table toppers. For my project, I decided to use our HBD Seasonal Table Runners pattern, volume 4. 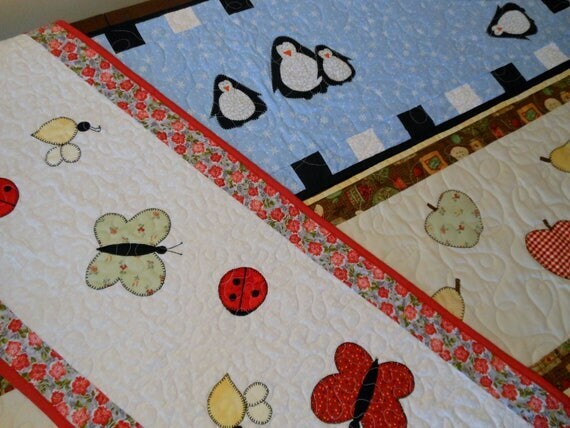 This set includes directions for a basic table runner with two border options, as well as applique patterns for winter penguins, spring bug-a-boos, and fall fruits. I'm going to use the penguin pattern for my runner and you're welcome to join me! 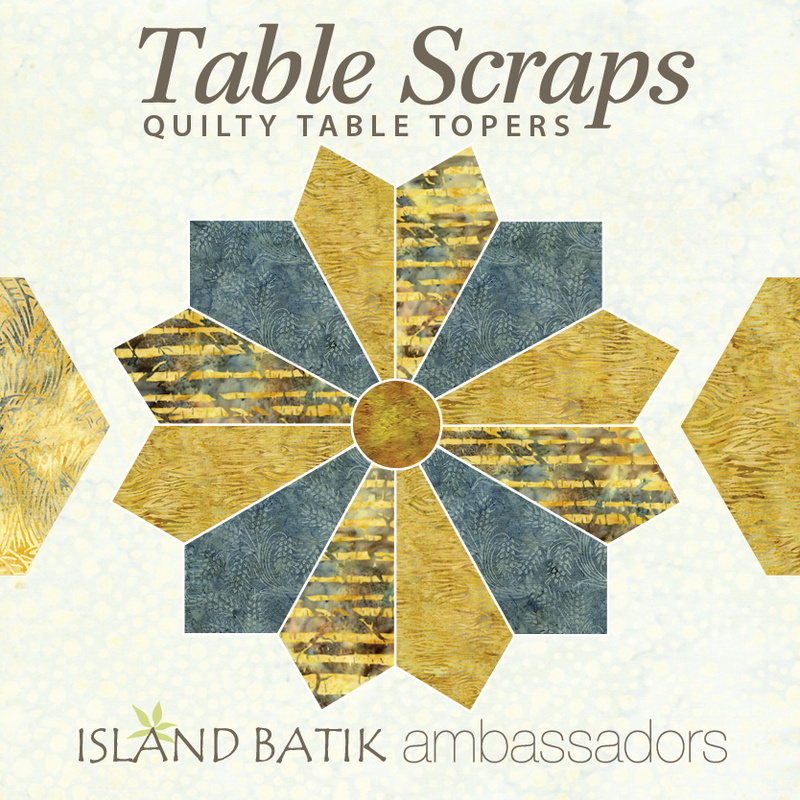 I'll be using fabric from the Autumn's Grace collection by Island Batik (with a few others added in) that I received in my summer Ambassador box! I'll be doing the checkerboard border using the fat quarters, my background is the white tonal print, and I'll be using scraps for the penguin appliques. The tan print will be my backing and my binding. Prepping my applique pieces went super fast! I decided to make a shorter table runner than in the pattern -- my center will finish 36 inches instead of 48 inches long -- I decided to do two sets of three penguins instead of three sets. With a little ironing, my center is complete! I used black thread to do all of the blanket stitching on the applique pieces except for the beaks. For the pieced border, I strip pieced the 2.5 inch squares from 4 different colors of fabric. Voila! My table runner top is done! 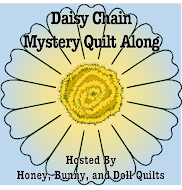 While I'm working on finishing up the quilting on this runner, leave a comment (or two!) 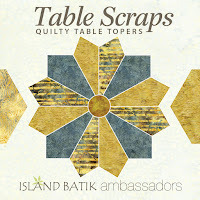 to win a bundle of the Island Batik fabrics I used in this project as well as the Seasonal Placemats pattern! 1. Leave a comment telling me your favorite Christmas/holiday cookies to make! I love making just about anything and am looking for new recipes! 2. Hop over to our Honey, Bunny, and Doll Etsy shop and leave me a comment with which of the Seasonal Placemats are your favorite! I think that next I'll be making myself the summer watermelon runner from Set #3! Update: Giveaway is now closed and winner will be announced soon! I'll leave the comments open until next Thursday, December 14th and announce the winner in the finished runner post! Sharing at Needle and Thread Thursday! How sweet are those cute penguins! They would like our Iowa weather today! Brrrrr. My favorite holiday cookie is one I posted about today...Raspberry Jam Shortbread. They are easy and yummy! I'd love to make a runner like yours, Alison! My favorite table runner pattern is the fruity one. A set of these made into placemats would be great! I love this table runner because it has Penguins, love penguins. My favorite Christmas cookies are Mexican snowballs. Our favorite Christmas cookies are called Cappuccino Flats and they come from the book BETTER HOMES AND GARDENS COOKIES FOR CHRISTMAS published in the mid-80s. It's still my favorite cookie book ever. I believe you can still find copies for sale online. I especially like set 3 -- the little chicks are the best! I love your penguin runner too. Pumpkin cookies are my favorite and I will be making some this weekend. I like the table runner set with the Christmas trees and I love your penguins. I will be making Snickerdoodle cookies today. The penguin table topper looks great! I just might have to make one--I have some penguin fabric that would be perfect for this! I like the tree placemats! Those penguins are adorable and the tree placemats are also my favourite. Love those penguins. Our favorite cookie is the snickerdoodle. Using crisco, not butter. Delicious. Hi, Very cute table runner! And you can leave it out for the whole winter. My favorite cookies are reindeer cookies. I'm making them for tomorrow's Virtual Cookie Exchange and will be posting the recipe then. Very quick and easy and fun to make. Those Christmas tree placemats look wonderful. I bet they sew up quickly. I love making gooey butter cookies. They are so easy and hard to mess up! The butterflies and lady bug runner would be my choice! Adorable penguins! My favorite cookie to make is oatmeal scotchies, my favorite to eat is soft molasses cookies. Maybe I should find a recipe and try making them? I adore the candy corn placemat in your shop! OH MY GOSH!!! I so need this pattern. I have a daughter who is a penguin FREAK. I mean she has even taken a vacation trip just to get to pet live penguins. She would so love this. I don't bake, so I don't really know a cookie that I like to make, but I sure can eat them, lol. Thanks so much for having the giveaway. Blessed be, hugs!!! I really love this table runner. The penguins are so adorable. I am not a big fan of baking cookies, but when I do, I like to make the Magic Cookie Bars. Thank you for the giveaway. I really love the placemats with the hearts on them. Beautiful! These penguins are too cute, I love them! My favorite holiday cookie has to be the classic sugar cookie. All of the placemats in your Etsy shop are cute but I think that the candy corn one is my favorite. Adorable - I love those penguins! I do love the Shamrock design in the shop too! Cute runner. I like Thumbprint cookies. I think set #3 is my favorite. I love sugar cookies, so easy and good. I do like the trees, very nice. The penguins are adorable. What an adorable runner! My favorite cookie to make at Christmas is rugelach. I like the tree placemats the best. I make a lot of oatmeal cookies. They can be plain or spiced with with nuts, chocolate chips, raisins, or dried cranberries. I also like to use white chocolate chips, for a different look and taste. I love the penguins! They're so adorable. Christmas or not, our favorite cookie is banana chocolate chip. I like the Seasonal Placemats #1. Great idea for different holidays. Cream together butter, sugar and flour with mixer. Fold in pecans and salt. Stir until combined. Mixture will be crumbly but stick when pressed into a ball. Roll dough into balls and place on ungreased baking sheet. Bake at 275⁰ F for around 45 minutes. Let cool completely on baking sheet prior to lifting to airtight container. May be kept up to one week in container. The penguins are just the cutest! I'm with you, I think a watermelon table runner may have to be on my table come summer! My favorite cookie is Oatmeal Raisin, love them. Beautiful runners. Those Penguins are cute. Have a great day! Our household LOVES penguins! Definitely my favorite! And we also love kruidnoten here, a dutch spiced cookie. I like set #3 as well, especially the leaf one. I love sugar cookies at Christmas. The stars are my favorite of your seasonal placemats. My favorite cookie is oatmeal raisin, not just for holidays, but anytime of year. I like the candy corn place mats.